thanks for your reply. After consulting with people in the lab we were wondering if you could send us a sample of both your antibodies so that we can test in our cell model. Let me know if this is possible. In case we have to pick one is there a way you can tell us which one most likely would recognize the murine form? We do not have small test samples available to send. I would say both ab19877 and ab68887 have an equal likelihood of reacting with murine samples as both have similar percentage identity to the immunogens used to produce those antibodies. Please let me know which antibody you would like and I'll make sure to send it out right away. I am writing in reference of the skp2 antibody ab68544 that we have recently purchased by you with . We were unable to detect a specific band in protein lysates from mouse smooth muscle cells, our primary cell model. Therefore we tested in MEFs wild type versus MEFs Skp2 null (negative control), see attachment. As you can see there are no differences. Could we exchange with another skp2 antibody that works successfully in Western Blot analysis of mouse cell protein extracts? Thank you for your enquiry and for including the western blotting data. I am sorry to see this vial of ab68455 is not working as expected. 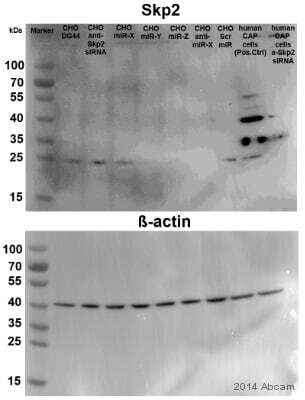 I would be happy to send you another vial of a different anti-SKP2 antibody. At this time none of our other SKP2 antibodies have been tested for reactivity to mouse SKP2. However, two antibodies to this protein that have a good chance of cross reacting with mouse SKP2, based on comparison of immunogen sequence with that of mouse, are ab19877 and ab68887. I would be happy to send either of these antibodies to you free of charge to test in your system.